30% of DNA exonerations have occurred after suspects’ false confessions. Here is another one out of Buffalo, NY. Conviction is vacated for 2 murders. Forensics : Expecting too much from Forensic Evidence does not Guarantee Justice US. All but 4 European MH17 victims identified. Denmark. More costs for taxpayers in wrongful conviction cases. Chicago. Most recent study of Illinois taxpayer exoneration costs is staggering. US. 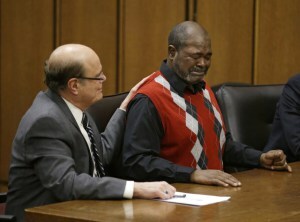 Ohio man exonerated after spending 27 years in prison. Cops coerced testimony from a 12 year old to put him in prison. Top Prosecution officials found to have strange concepts about Justice. Canada. Overlooked audiotape of Michael Brown shooting. US. Clevelan police avoid mandatory DNA testing for felony arrests. US. Jordanian forensic experts to help in Palestine. Middle East crises. What they did not acknowledge was that there are likely innocent people in prison and jail because of that faulty forensics information. Here is a snippet of one media article. Note that the flawed testimony given by the FBI included death penalty cases. Sweet. In private industry, if you even have a mere forklift driver whose work is putting other workers at risk of death, we all know that forklift driver gets fired.